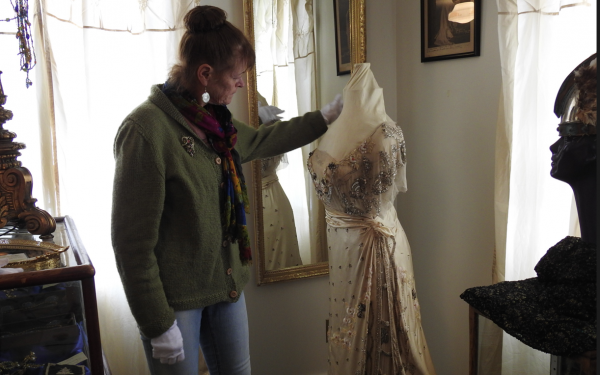 Crystal Williams, collections manager and caretaker of the Nordica Homestead Museum, shows one of Lillian Nordica's gowns. The museum's collection is undergoing a complete inventory for the first time. 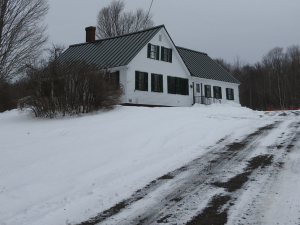 The Nordica Homestead Museum on Holley Road in Farmington. FARMINGTON - Within an unassuming 175-year-old cape style farmhouse on Holley Road, a careful inventory was underway. Once the work is completed, this will be no ordinary list of a family's memorability. Instead, it will be a professionally archived collection of priceless treasures that may provide a more complete story of Lillian Nordica, one of the late 19th and early 20th century's most renowned opera singers. The super star soprano was born Lillian Norton in 1857 at this homestead. She lived a fascinating diva life that included travel all over the world to perform major operatic works, had three husbands, was a spokesperson for women's suffrage, was one of the first celebrity "Coca-Cola girls" featured on trays advertising the soft drink and even endured a shipwreck. At the age of 57, she survived the ship running aground but later died of complications from pneumonia while undergoing treatment in the former Dutch East Indies, now Jakarta, Indonesia on May 10, 1914. Ten devoted fans of Nordica had the foresight to establish the Nordica Homestead Museum as trustees by each paying $100 to purchase the Norton property in 1926. Collection of the priceless gifts that include furniture and sculptural art given to Nordica by the crowned heads of Europe and Asia, along with grandiose costumes, the stage jewelry made by Tiffany and the glorious gowns she wore while hobnobbing with the rich and famous, are among the treasures that were gathered by the trustees. Ben Stinchfield, of Farmington and New York City, is particularly noted for his relentless pursuit of finding Nordica's possessions, purchasing them and bringing them back to the museum during the 1930s. "He hunted them down for the Nordica collection," said Crystal Williams, the museum's collections manager and caretaker. Williams started her tenure here last spring. Her most immediate task was to install security alarms and video surveillance equipment on the property. Another priority was to move the extensive collection of costume jewelry into secure glass cases. 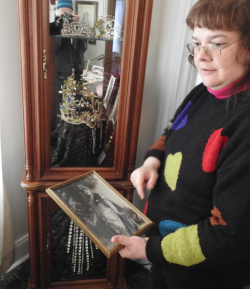 Jennifer Colby-Morse shows a photograph of Lillian Nordica wearing the tiara that sits in the glass display case at the museum. Williams held summer functions at the homestead and dressed up as Madam Nordica for the local parades in an effort to bring awareness of one of Farmington's gems located just two miles from downtown. As she settled in as caretaker, she was amazed to find out that no one had ever completed an inventory of the house full of historical wonders. Several attempts were started but there wasn't a comprehensive list of what the museum contains to this day. Last September, a small collection from the Nordica Museum was included at the Farmington Historical Sociey's display at the fair. As luck would have it, Jennifer Colby-Morse, who has worked extensively on inventory and digital recording of the collection at the Norlands Living History Center in Livermore, happened to see the exhibit and meet Williams at the fair display. "They were playing her (Nordica's) music and there was this wonderful display," Colby-Morse said. "She said, 'I'd like to help you,'" Williams remembered Colby-Morse as saying. From subsequent meetings, the two women determined that an inventory of the museum collection was imperative. Since then, Colby-Morse, who is volunteering her time to do the work, has designed an Excel program to meet the needs of a thorough inventory. 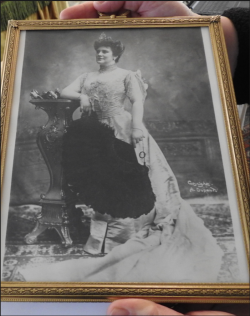 A framed photograph of Lillian Nordica at the height of her career. "We need to know what we have," Williams said. Not only for insurance purposes, but there's the idea that there may be hidden treasures detailing Nordica's life that have been tucked away and forgotten and are waiting to be rediscovered. Helping in the treasure hunt is a University of Maine at Farmington anthropology major. In her junior year at UMF, Josie Pease of Lexington Township, was wearing soft white gloves as she carefully looked through the stacks of papers, photographs and small items set on a table. "I've always been interested in learning about people and their histories," Pease said. Colby-Morse's inventory of every piece of the diva's life to be entered into her computer program begins with assigning it a catalog number, notations on where it was found, name of the item, description, its conditions, measurements and comments. Most importantly, is how each item fits into Nordica's history. A short narrative that may include a date, its relevance and so on are also recorded. This methodical and time-consuming process may take a few years to complete, Colby-Morse noted. "All of the items need accountability," she explained. In the short time Pease has been helping with the inventory she's discovered that working at the museum is something she loves and wants to continue as a career once she's graduated. "Learning to catalog is a great, valuable skill to have," she said. "There's so much stuff here," adding that although she grew up in northern Franklin County, she'd never heard of the Nordica Museum before. As the women worked, Nordica sang to them. As many as 30 of her gowns have been frozen and are stored at the Maine State Museum in Augusta. Freezing them stops any further deterioration from light, dust, and insect damage, until the effort to preserve them can begin. But that won't happen anytime soon at an estimated restoration cost of $30,000 for each gown. For now they sit in a sort of suspended animation waiting for a very big grant to be awarded so someday they can be seen again. That is on Williams' to-do list, as is funding the inventory work. Computer software especially made for museum catalog work costs $800 and while Colby-Morse volunteers her services, Williams wants to see her be able to receive a stipend to continue what may take years to complete. Meanwhile, there are about 10 gowns and costumes on display including an intricately beaded dress with a train given to Nordica by the Czar of Russia. It stands near a round tilt table with a detailed design painted on it that the Empress of China at the time gave her. "It's unbelievable what's here," Williams said. The museum is open from Memorial Day weekend through Labor Day weekend and by appointment. As a child I have many fond memories of staying with my grandparents, Ruth & Lewis Wade when they were caretakers of Nordica Museum. It was a great place to learn and explore as a child. There was a music box that on occasion my grandfather would allow us to listen to, it always held my attention as you could see all the inner working parts as it played. There were beautiful black carriages and even an horse drawn hearst in the upper barn at that time. It was probably the first place I remember taught to "look but not touch" and being mesmerized by the pretty things. It's nice to know the history will be preserved for future generations. I grew up across the road from the Nordica Homestead. We used to visit there often. I remember Ruth and Lewis Wade. Also the Keif's. As I recall up in the woods behind the barn was a road/trail that led to a tennis court. Jennifer Colby-Morse is an excellent choice! The collection is in good hands. I hope funds are found to pay her for her contributions. I grew up in Fairbanks and have visited the museum many times as a member of the Skillful Workers 4-H club. It is a point of pride that Madame Nordica came from the Holly Road. I also have fond memories of Ruth and Lewis Wade showing us the museum treasures. I am in hopes to open the wonders of Madame Nordica to my granddaughters. Thank you so much for taking the time to inventory this fantastic collection. I grew up on the Holly Road and remember Lewis and Ruth Wade very well. They were real nice people. I visited Nordica Homestead many times as a kid. Have many fond memories of the Wades and all the people on the Holly Road in the 1940's and 50's. Thanks for the wonderful article! I just want to include a shout-out to the Partnership for Civic Advancement and UMF for making Josie's internship a reality. Also their director, Lorraine Pratt, for contacting me and offering their support. And, of course, Josie's UMF advisor on the project: Dr Luke Kellett Thank you all for helping to get this project on its feet!